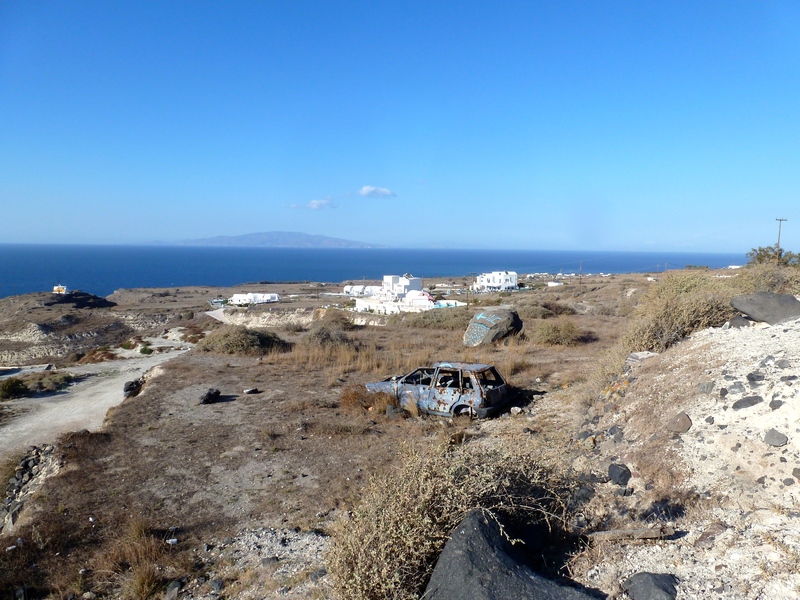 October 22, 2014 October 22, 2014 Posted in College Graduate Problems, Europe, Thoughts, Traveled PlacesTagged Adventure, Anny Studios, Europe trip, Greece, life, mid-20's, Oia, Santorini, travel, travelers, What is life? I spent the last ten days on the Greek island of Santorini, exactly six more days that I had originally planned. 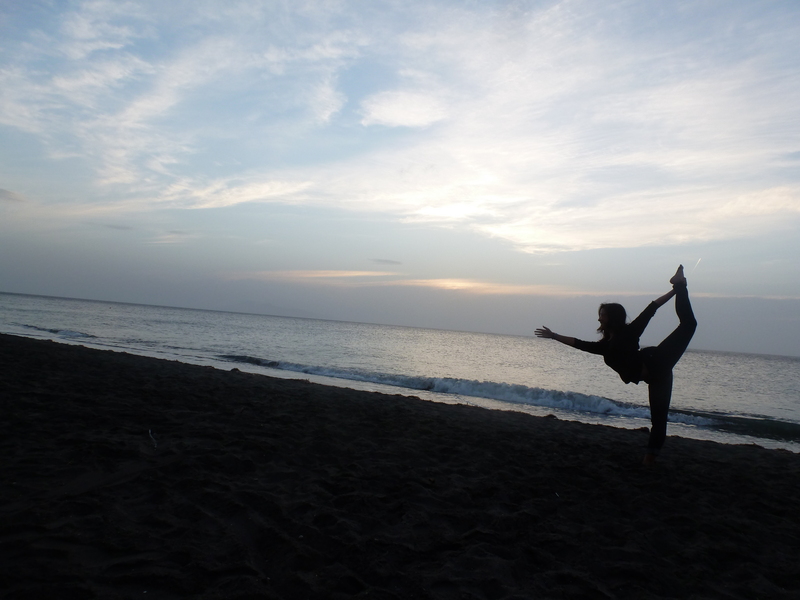 My trip was partly delayed due to the black sand beaches and the perfect weather. The connecting ferry to Turkey only ran three times a week and Thursday became Sunday, which became Tuesday all too fast. But my trip was also delayed because of the incredible group of travelers I met during my stay. This group of people seemed to be as captivated by the island as we were with one another and we spent every waking moment enjoying this little slice of paradise together. The group, composed of Canadians, Australians, Germans, Philippinas, Haitians, Spanish, Greeks, Colombians, Indians and Americans, all shared a love of travel. And in this love, we also shared a mutual desire for some change from our lives back home. Three women (including myself) quit their jobs to travel alone. 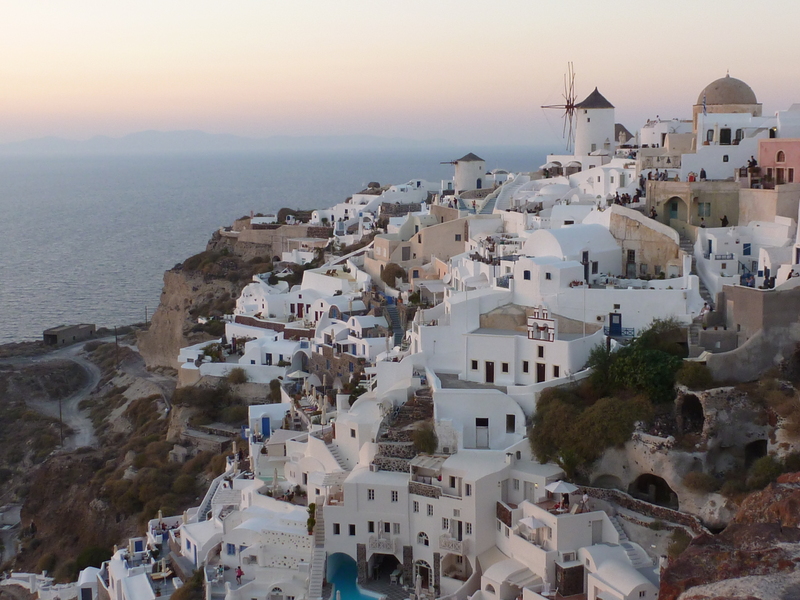 One woman spent a month in a meditation retreat and an Australian girl longed to return to Santorini instead of attending university in the fall. Chanae, the person I met in Athens and followed to the island, hadn’t been back to Australia in almost two years and had no clear date for returning home. I felt as if we were all searching for something–an answer perhaps–without clearly defining the questions at hand. Some travelers want to see the world. For them, the questions are simple: “How can I travel forever?” or “How can I increase my maximum vacation time?” But for others, I think the search is much less defined. Will I find someone to love me? What should I do with the rest of my life? These questions will not be found within stamped passport pages or months overseas. But that doesn’t mean we can’t try. One evening, I found myself wandering the streets of Oia before meeting up with the group for the famous sunset. The day had been full of sightseeing and my skin was tight under a layer of sea salt and sweat from my morning swim and afternoon hike. I was dehydrated and my legs threatened to give out as I trudged up a rocky path to get a better view of the coast. Down the hill and to the right, I spotted a car. It had been unoccupied for quite some time based on the model and the thick layer of rust underneath the faded blue paint. No wheels remained and someone has piled large rocks onto the driver’s seat and under the hood. On the back left end of the car in scratched white lettering, the words What is life? had been written. 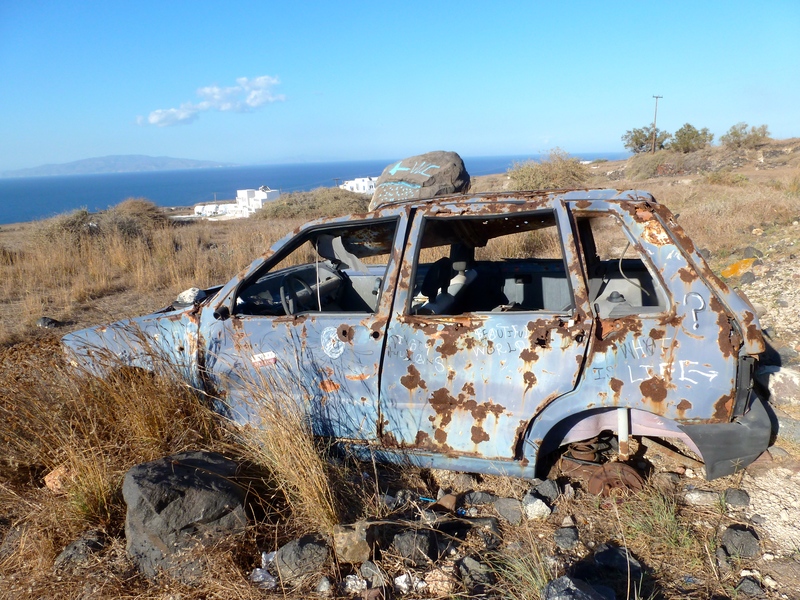 I sat in the fading light of the Santorini sun for a long time staring out to sea and contemplating the words of the car. 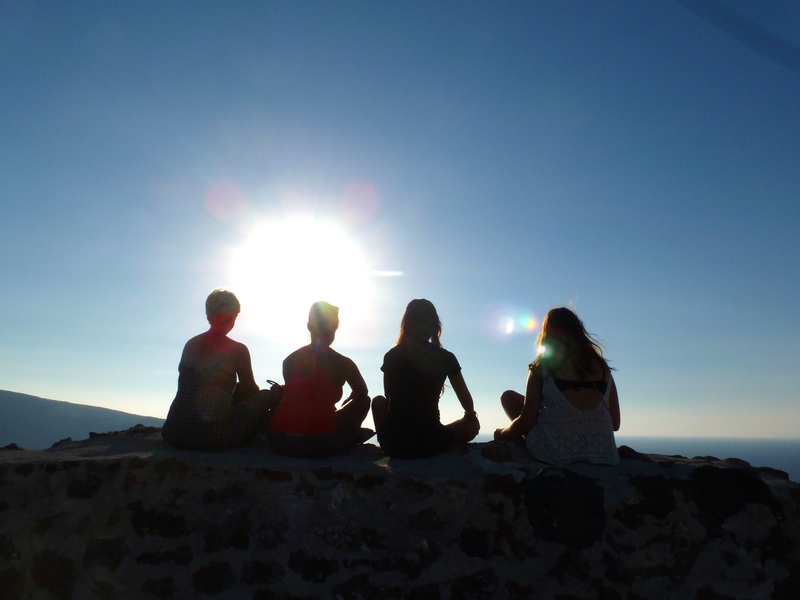 I thought about this new group of friends: our morning yoga during the sunrise on Perissa Beach and the nights spent comparing cultures over wine and ouzo shots. I thought about my imminent move to New York City and my undefined relationships with people back home. I thought about the pressure I put on my European exploration to conquer some great internal unknown I had yet to identify. For I’d rather spend time contemplating the meaning of life with equally confused people than trying to figure it out all alone. Lovely post! I still struggle with these life questions too, that’s why I love to travel and explore new places. It always gives me some sense of clarity.